I did pretty good shopping last week, but this week was even better! I had my yearly bonus Costco check so I was able to score quite a few things from there for free. Plus, they give cash back if you do not use the whole check and since that is part of my grocery budget it goes right back into the pot. I even had some Easter candy “splurges” this week. If you want to see the current matchups then just click on the store link! Tax was $0.76. I saved $21.11 using Price Chopper sales, $6.50 using manufacturer coupons, and $1.98 using Price Chopper (kids club) coupons. Tax was $0.91. 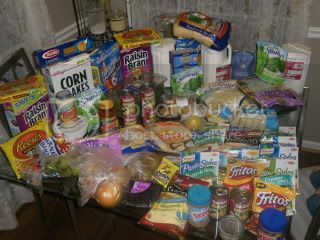 I saved $24.00 on HyVee sales, $5 using HyVee coupons, and $2.25 using manufacturer coupons. Tax was $0.37. I saved $7.20 on Apple Market sales, $0.05 for a sack refund, and $4.58 using manufacturer coupons. Tax was $2.14. I saved $15.34 compared to my local grocery store. This week I bought $176.94 in groceries for $21.46. That is a savings of 88%!!! You are my hero! I've just starting figuring out how the whole couponing/sales things goes. My savings are going up, and my cost going down…but I am not quite this good…yet! Thanks for all your post. Love your blog. Thanks 🙂 I love to save money and teach others how to do the same thing! Previous post: Space Chimps for Wii $8.99 Shipped!